It comes with a new vector aesthetic design 174.5° dot-cutting with 6.85mm at its thinnest point and air-cooled technology with nine heat radiation air slots on the back of the metal body to increase the heat transfer of the mobile phone to keep the phone cool when gaming. It has a game button that activates gaming mode by limiting the background network and option to block calls, SMS, notifications, etc.The body is made of triple anodized aviation-grade aluminum alloy that has gone through 5 sandblasting processes and uses new lamination technology with three-layer graphite lamination that increases thermal diffusibility by 117%. It has 16.8 million color RGB color lights on the back. 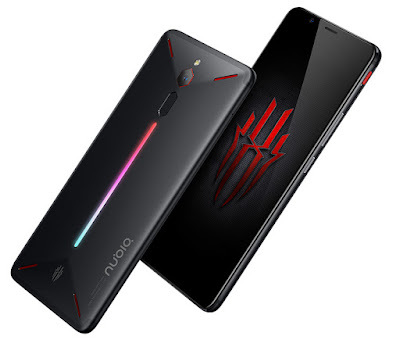 On Camera it has a 24MP rear camera with f/1.7 aperture, 6P lens, dual-tone LED flash and 8MP front-facing camera with f/2.0 aperture, 76.9-degree wide-angle lens.Nubia has optimized 128 games fully offering high-frame rate, smoother performance and also increases game loading speed by 50%. It packs a 3800mAh battery with NeoPower 3.0. Nubia Red Magic comes in Black and Red color priced at 2499 yuan for the 6GB RAM with 64GB storage version, 8GB RAM with 128GB storage version costs 2999 yuan. It goes on sale in China from April 25th.